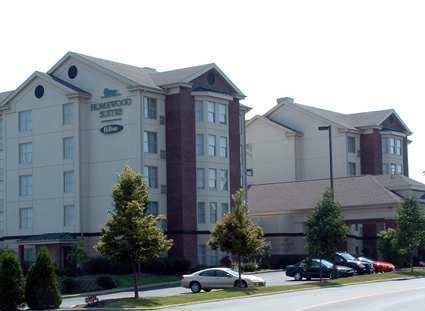 THIS HOTEL IS 100PCT NON SMOKING The Homewood Suites by Hilton Dayton-South hotel is ideally located adjacent to the Dayton Mall just off Interstate-75 Exit 44 or Interstate -675 Exit 2 in Miamisburg /South Dayton/ Ohio. Our upscale all-suite residential style hotel is the perfect place to call home when your travels take you to Dayton Ohio. Nearby points of interest include the Cox Arboretum Gardens numerous Dayton golf courses Regional hospitals and of course the US Air Force Museum. Downtown Dayton and its attractions including the Dayton Convention Center and University of Dayton are a quick ten miles to the north. Wright Patterson Air Force Base /WPAFB/ and The Fairfield Commons Mall is 12 miles to the northeast on I675. Kings Island Amusement Park is only 20 minutes to the south on SR741. Whether you are looking for an extended stay in Dayton Ohio a corporate apartment hotel reservations for a Dayton business meeting or just want a suite for the weekend to relax our location offers easy access to all of Dayton. Guests of the Homewood Suites by Hilton Dayton-South hotel enjoy a host of amenities from this Dayton Mall area hotel including Suite Start hot breakfast. complimentary high-speed Internet access. indoor Fitness Center with cardio equipment. outdoor heated pool whirlpool and sport court. two-room suites with fully-equipped kitchens. Welcome home reception /Mon-Thu/. and Suite Shop convenience store Hilton HHonors participation. We invite and welcome you to Dayton Ohio. Make Yourself At Home.